I planned this trip on a wave of optimism, yes there was fog forecast but surely it wouldn't be bad & it'll clear early, or so I thought? The plan was to meet with Noel & paddle out to Flat Holm then onto Monkstone lighthouse in the middle of the channel. I arrived at Sully at 7AM in a real pea souper, I could barely see sully Island just opposite the causway. I was really glad that I had the foresight to charge the GPS batteries ready for the trip in anticipation of worsening conditions. The GPS also has the advantage of cross track error, instant vectors that is & makes for easy navigation across the tidal currents of the Severn. I ain't been out with Noel for ages & he was keen to get on the water despite the conditions. This would be his first journey to Flat Holm. It was an uneventful crossing though its tricky holding course when theres nothing at all to aim at. Evan night navigation provides plenty of targets but all we could see out here was fog. Signs of life on the Island. I wonder if they could see us? We round the South side of the Island so as to do a near complete circumnavigation. I show Noel the obligatory cave to paddle into. My turn, theres no swell here today so I go in deep, right to the back using my hands against the walls, roof, whatever I could grab. I guess this is where the resident Peregrin falcons live. I don't believe this was here last year & I reckon their loving their new home. We only saw the one falcon today & I think Noel was pretty chuffed with that. Time for a wander. We left the kayaks above the high tide line as the tide was still on the flood & we would quite like our kayaks to still be here when we return. After a pleasant walk we discussed our options & decided to leave Monkstone for another day as the visibility had deteriorated quite considerably when I was hoping that it would have improved. I seal launched into the water & wished I'd put on my pogies, brrrr! Thats Castle rock just behind Noel though its pretty static at the moment. I decide we should leave at slack water about 15 minutes before high water. Its probably not totally slack but I know from experience that this is the time to go if you want to get to Lavernock. Again it was tricky holding course with bugger all to aim off at but eventually Lavernock Outfall Buoy came into view on our left. We were well on track. Finally, within 490 metres of land we made out the very faint shadow of Lavernock & could relax & ease off the pace a bit. I evan had time for a couple of rolls, a very bad idea, brrrr! Then just a short & lazy paddle back to Sully for a cup of tea in Myvanwy. Nice post, wonderful coast! 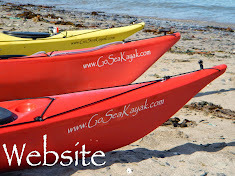 Great kayak colors, like orange/yellow/white combination! And very good to see in that fog! Who's Bloody Idea Was This?